Vitamin C (ascorbic acid) is an essential nutrient in the body. As a water-soluble nutrient, Vitamin C can't be stored in the human body and must be replenished from daily external resources. Enhanced with Rose Hips, Nature's Bounty Vitamin C helps maintain good health, providing a gradual release of Vitamin C throughout the day. 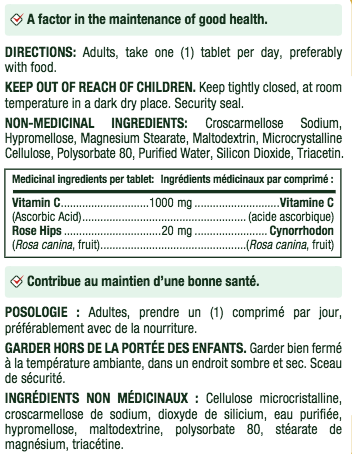 I have always used this product and I prefer it to any other Vitamin C as it releases over an 8 hour period. That's why I recommend this product. It's better than any other Vitamin C. It's good for people who smoke. This product is irrational. 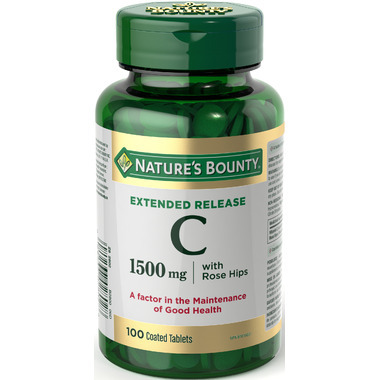 Vitamin C = ascorbic ACID can only be absorbed under the acidic conditions of the stomach. With extended release the vitamin C won't be released until too late, and will simply become a "treat" for the bacteria of the gut. I was very disappointed to find a product supposedly good for my health that had HYDROGENATED COTTONSEED OIL in it. If I had know that before I opened the package I would have returned it. I will not buy it again.